Food guide Suresh Doss goes to popular Irish pub Allen's to taste the cooking of the Sri Lankan Tamil chef. In every corner of this city there's a great pub. Dimly lit establishments laden with wood and brass, they can feel ancient and at the same time greet you with a warm welcome from the moment you step in — a place where the food is homely, and the bartender knows your drink and pours it before you have a chance to pull up to the barstool. One of my favourite pubs in the city is Allen's on the Danforth. When I was first introduced to the pub, I fell in love with the dark, warm and woody aesthetics. It provides a menu filled with classic pub fare, complemented by an impressive whisky list and an even more impressive Ontario wine list. There's also the quaint patio at the back, which instantly steals you away and protects you from the soundtrack of the city. I have been a semi-regular at Allen's for nearly two decades. For the first little while I knew almost nothing of the pub's story, the owner or the chef. To me it featured one of the best burgers in the city, made with hormone-free, local beef which is ground in house. It is one of the simplest burgers I've come across, but it packs an intense flavour. Then one day many years ago, an appetizer changed everything. It was late spring and I was out sitting on the patio when a plate was placed in front of me. 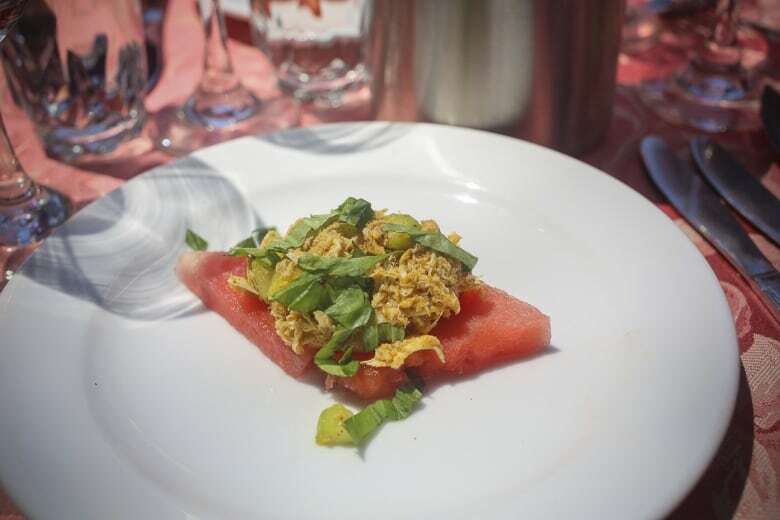 It had a thick slice of watermelon topped with a mound of what looked like spiced crab meat. I remember my first thoughts when I took a bite: "This reminds me of back home ... 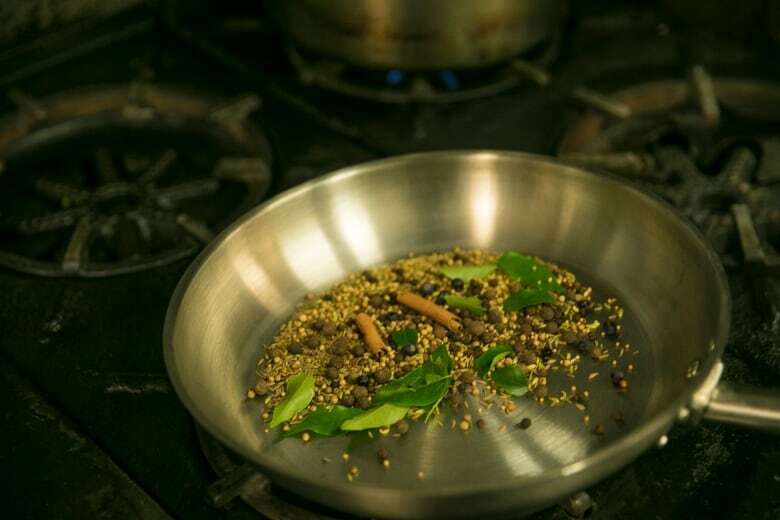 This is Sri Lankan … This is how my mom spices crab … How is that possible?" My curiosity got the best of me and I asked if I could speak to the owner. That was the day I met John Maxwell, then owner of Allen's. Over the years I've had the honour of getting to know Maxwell. He's been in the restaurant industry for over 40 years, owning and running establishments in both New York City and Toronto. Since opening Allen's in 1986, he's used his classic Irish pub to advocate for Canadian ingredients. From the Ontario-raised beef on the menu to the VQA wines, Maxwell is one of the biggest supporters of local foods I know. Maxwell has also supported multiple generations of Sri Lankan Tamil cooks throughout his career. "My Toronto restaurant life has involved people from every nationality one can imagine, but I can say with assurance that members of no group work harder, or with greater commitment, than do Tamil professional cooks," he insisted. Maxwell introduced me to chef Ponniah Vijeyaratnam. "Chef Vijey was the first chef I hired. We have known each other for many years," he explained, offering me a plate of his shrimp curry. Vijeyaratnam makes his own masala by toasting a dozen spices and hand grinding it. He then cooks shrimp and vegetables with the masala and coconut milk to thicken it. Each spoonful is an explosion of spices. The shrimp curry used to be a hidden menu item but it quickly gained popularity and is now a staple item on the menu. Vijeyaratnam was born in Jaffna, Sri Lanka. He left the country during the civil war when he was 17. After spending six years cooking in Greece, he found his way to Canada. He met Maxwell through a fellow Tamil and began working for him. When Vijeyaratnam eventually took over as head chef in 1992, Maxwell gave him free rein over the kitchen and the menu. Since then they've hired newcomer Tamil cooks exclusively. "My entire kitchen has always been Tamil cooks," he told me. "Many of them have only been here for a few weeks or months before they started working here." 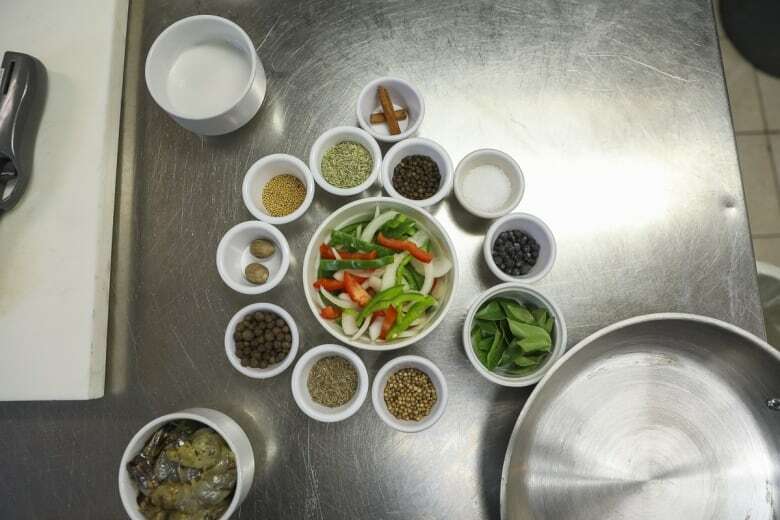 Over the years I've spent in the kitchens of this city, I've come across many Tamil cooks. It has been referenced by many chefs that they are the backbone of the hospitality industry in this city. For New York City, it's the Colombians and Mexicans. For Toronto, it's the Sri Lankan Tamils. When Vijeyaratnam moved to Canada in the early 1980s, there were fewer than 200 Tamil Sri Lankans living in Canada. Today, the Tamil population in the GTA is estimated to be over 200,000. The first wave of immigrants came here in the late 1970s and early 1980s, pushed out by the civil war. Many of the young men that arrived here gravitated toward the restaurant industry because they didn't need to speak English and it was easy to get a job, Vijeyaratnam explained. I've spoken to many chefs about this over the years. 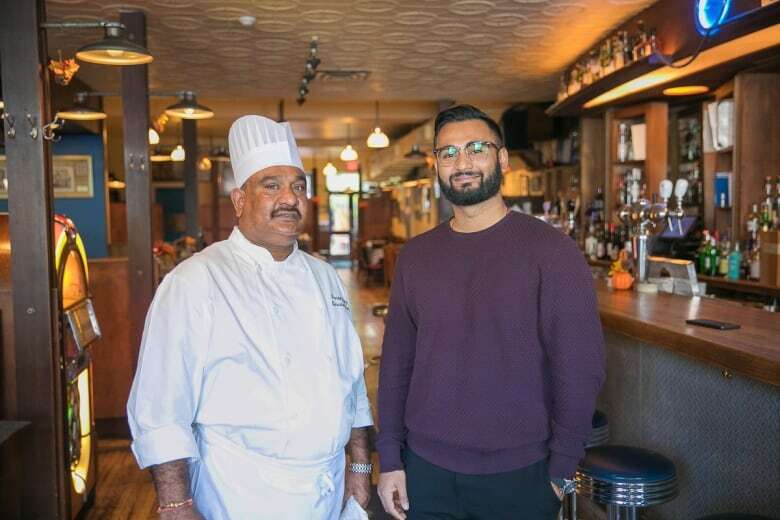 It is estimated that over 75 per cent of the city's restaurants, from the Danforth to King West, employ at least one Tamil in the kitchen, whether as a dishwasher, line cook, or head chef. John Horne, executive chef of the Oliver and Bonacini company, once said that the company translated its handbook and health and safety information into Tamil. 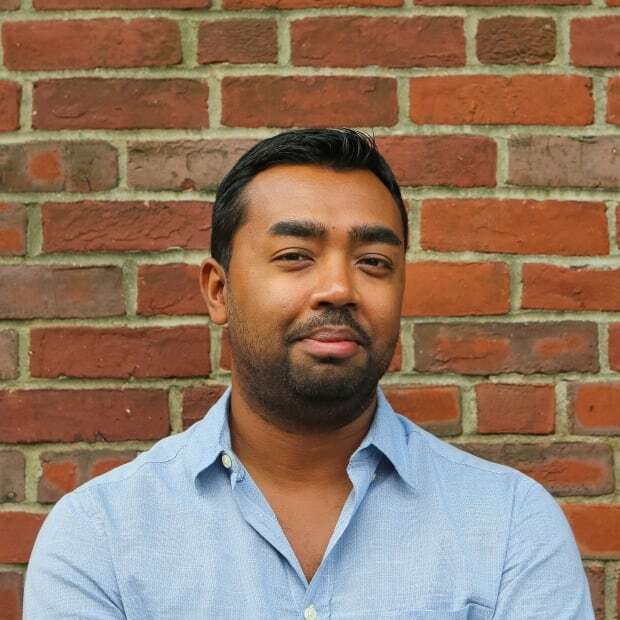 "We have Tamil staff that have become the backbone of many of our restaurants," Horne said. Since it first opened its doors, Bar Isabel has employed a number of Sri Lankan Tamil cooks, Chef Van Gameren noted. "They're some of the most dedicated cooks I've had in the kitchen, and they seem to have a knack for seasoning," he said. 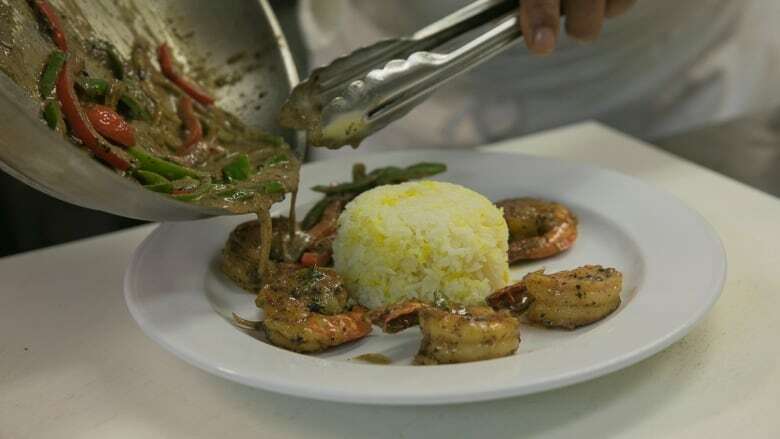 At Allen's, Vijeyaratnam grinds his own spices for every batch of shrimp curry. "Maxwell has had a lot of faith in me and my cooks. If it wasn't for him, we wouldn't be able to do this." Three years ago, Maxwell decided it was time for retirement, so he sold the business to Vijeyaratnam and his son Amalan. The father runs the kitchen and the son manages the front of house. "It's a classic success story of immigrants coming here and adding to this city," Amalan said.